Query-driven data modeling. Application queries should be build before creating a data model. Every query should have its own table. 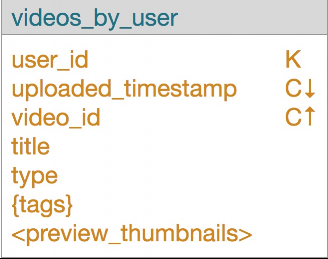 Name tables after queries ex (videos_by_tag_added_year). It’s okay to have duplicated data across multiple tables. We don’t care about space, we care about speed. Cassandra will do an upsert if the primary key and clustering key in a cell are not unique. Primary keys, clustering keys and clustering order can’t be change after a table is create. You will need need to create a new table and move old data to new table. You can only do range queries on clustering keys. Make sure data is duplicate at a constant duplication. If data is duplicated 25 x N, limit N to make the duplication factor constant. A partition can only have 2 billion cells. You are likely to hit performance issues before hitting this limit. A cell or column is a key-value pair. Trade-off between efficiency and space. Use client side joins and don’t duplicate data. There are no JOINs in cassandra. Use BATCH statement to update or insert all duplicated data. Cassandra has SQL like sytanx call CQL for creating and manipulating. The formula below can be use to calculate how big a partition will get to overtime. If a partition gets bigger than 2 billion cells, performance will be affected.